Welcome to the Allergy Clinic! We would like to point out a few things that will help your first visit go smoothly. Appointments can be made by calling our friendly staff at 503-228-0155. Please arrive 15 minutes prior to your scheduled appointment time to complete the registration paperwork. Your first visit may take anywhere from one to two hours, depending on the type of testing which may be necessary. 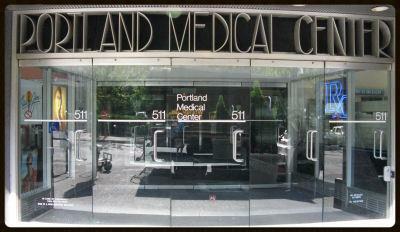 We are located in Suite 1301 of the Portland Medical Center (aka 511 Building), which is the tall, grey building with blue windows (across from the food carts) at 511 SW 10th Avenue between SW Alder and SW Washington streets in downtown Portland. Sometimes we will need to do selected skin tests as part of your allergy evaluation. Please do not take allergy or cold medications for at least 5 to 7 days before your appointment. These include antihistamines such as Claritin, Zyrtec, Allegra, Alavert, Clarinex, Benadryl, Actifed, A.R.M., Nyquil, Chlor-Trimeton, loratadine, burbur, quercetin, Astelin, and Patanase or similar medicines (please see the Antihistamines page for a more detailed list). These medications will make your skin tests unreliable. If you are taking other medicines (such as those for asthma, high blood pressure, or other conditions), continue to take those as prescribed by your doctor. You may continue prescription nasal anti-inflammatory sprays such as Flonase, Nasonex, Nasocort, Rhinocort, or Veramyst (refer to this complete list of medications you can continue). Please bring all medicines that you are presently taking to the appointment. If you have questions about which medicines to stop taking and which to continue, please call to discuss with our nursing staff. In compliance with certain insurance company policies, if your health insurance requires a referral before being seen by a specialist, it is necessary that you contact your primary care physician and obtain that referral prior to your visit. We will need any referral information and your insurance card on the day of your first appointment. If you have any questions concerning registration, billing matters, or insurance matters, please call our Business Office at 503-222-1966. Please take a moment to review the map of our location. Our office will validate for free parking at the SmartPark located at 730 SW 10th Avenue between Yamhill and Morrison. If you have questions about parking, please call our receptionist at 503-228-0155. We look forward to seeing you at the Allergy Clinic!